Blu Wireless in Bristol has been named by the European Commission as a key innovator in its Innovation Radar Platform. The company has been a key part of the 5G-XHaul project, which is evaluating a converged optical and wireless transport network to flexibly connect small cells to the core network. Blu Wireless has developed and successfully demonstrated 60GHz millimetre-wave backhaul networks. These are used for carrier grade high speed, low latency and economically smart 5G gigabit connectivity for combined backhaul and broadband and are ready for deployment. It has worked alongside Huawei, I2CAT, University of Bristol and Telefonica I&D. 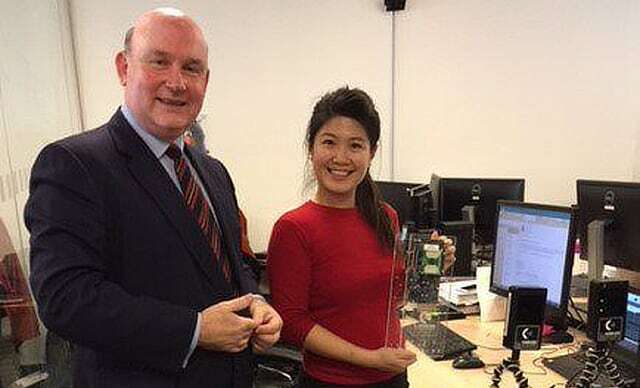 Tim Bowles, mayor of the West of England Combined Authority, visited the offices in Bristol meeting applications engineer Jamie Lee (above right). The company has also teamed up with LGS Innovations on gigabit wireless communications for 5G applications such as gigabit grade Fixed Wireless Access. Blu Wireless has been working with LGS Innovations to integrate its HYDRA gigabit mmWave modem technology with the advanced W-Band active phased array technology from LGS. Blu Wireless has been demonstrating its new dual HYDRA 1.0 gigabit mmWave modem technology, with LGS Innovations latest generation of advanced mmWave active phased array radio technology.